We’ve entered a new chapter in local birdwatching. Spring migration is past, and we can now settle into watching the resident birds. This is exactly what I did on a recent Sunday morning. Of course, morning in bird time is at about 4:30 a.m. That’s when the robins start to sing in my neighborhood. The saying “the early bird gets the worm” definitely fits in this case. The cardinal adds to the chorus 15 minutes later. The sweet song of the familiar cardinal never feels ordinary to my ears. I lay in bed and through the open windows I listen for him. Will he choose “woit, woit, woit, chew, chew, chew, chew”? Or will today start out with “pichew, pichew, tiw, tiw, tiw, tiw”? It’s not the same everyday, and that mystifies me. I can think of no better greeter to the morning than the Northern Cardinal. I am sitting on the deck amidst the garden, wrapped in a blanket with a hot cup of tea by 5:00 a.m. It is then that the House Wren springs forth out of his night roost and begins to sing with much vigor. He bursts into song that last a solid half hour. It is amazing that anything so small can be so lively and loud. All the while, the sun is starting to show itself and the light on the birds is tremendous. 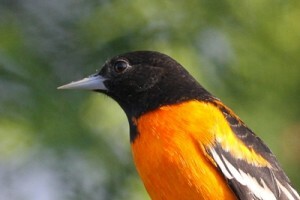 And the most tremendous bird by way of color is certainly the Baltimore Oriole. Each time I see them, I am in awe by the vibrant orange and deep black plumage. The dominant male oriole announces himself at about 5:15 a.m. from some nearby perch that I cannot see and then heads into the yard from the east. Over the cedars he comes, stopping by to check out his supply of nectar, grape jelly and mealworms. After a quick breakfast, he is on his way, always leaving the yard by flying between the houses toward the street. Before he takes flight, he sings again from the feeder. Next in line is the other male, who is not quite as brilliant in color. He’s always second to eat. Also arriving and accompanied by lovely song are the goldfinches. A resident pair comes in each morning to feed together. I guess all the other goldies have left to establish a breeding area elsewhere, as these are the only two who show up. It’s always a real pleasure to have nesting goldfinches. Even though nest building doesn’t begin until July, the male has been singing and engaging in courtship flight, swirling into the air above the yard as he serenades the female below. One of their favorite places in the yard is the corner where the coreopsis and the woodland sunflower are blooming. They often visit there after they eat at the finch feeder. 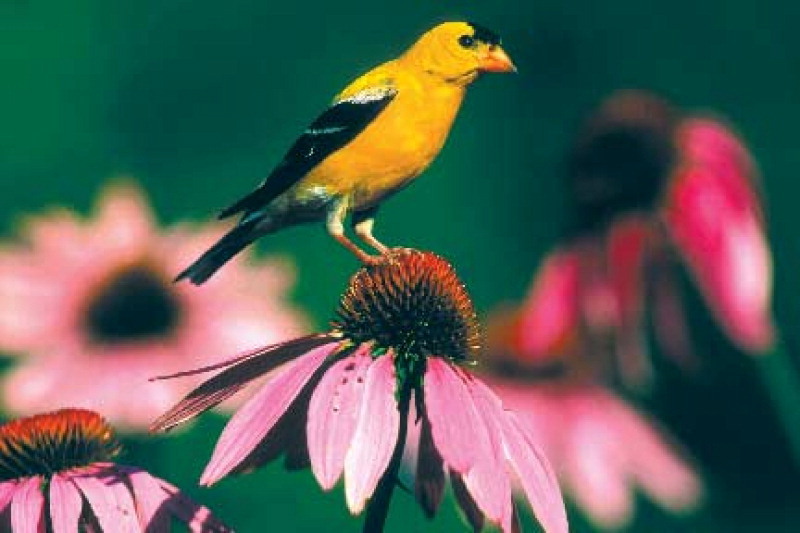 Throughout the morning I hear their soft whistles and see their little yellow heads amongst the garden flowers that compete with them for brightness. The sunlight is now filtering down through the cedars and the only way to tell who is at the low birdbath is to use binoculars. This is the favorite birdbath in the yard, for it has the dripper and the birds sure seem to enjoy a good shower. Sitting as still as possible so as not to alarm them in their vulnerable state, I get great looks at female oriole, followed by a starling, robin, female cardinal and then a Red-breasted Nuthatch, the bonus bird of the morning. 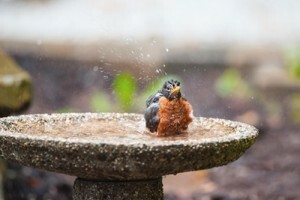 Each one of them has taken the time to splash themselves all over with the water from the dripper, then leave by hopping up the branches of the cedar until a safe place is found to preen before flying off. 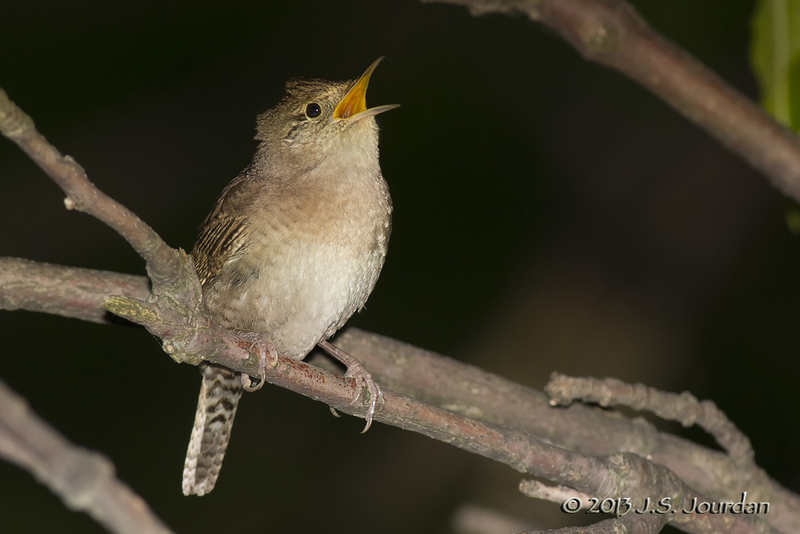 The House Wren has taken up with song again. His breakfast time must be over. He starts in one corner of the yard and covers all corners and places in between, including singing from the gutter on the second floor. He looks so small up there. His size reminds me that this bird has come from as far south as Central or South America, and I am amazed by this feat for such a small creature. So much entertainment in such a short time! In a little over an hour, I’ve had a quality dose of nature that I can reflect on all through the day. It makes it worth it to greet daybreak with the birds every so often. The morning chorus of spring begins quite early in the day. I’ve heard robins singing at 4:30 a.m.! A songbird or oscine is a bird belonging to the suborder Passeri of Passeriformes, in which the vocal organ developed in such a way as to produce various sounds that we commonly refer to as bird song. Interestingly, many of the birds that belong to this classification do not have a song that we would consider melodic. 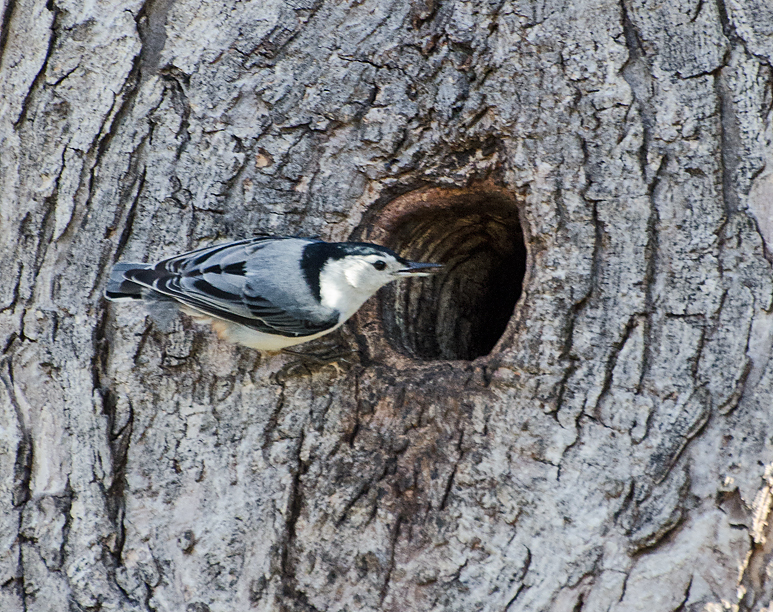 Take the nuthatch, for example. 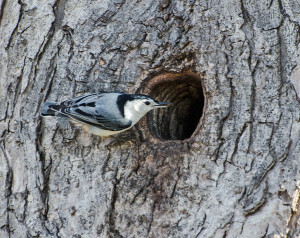 The repetitive “wic, wic, wic, wic” may not sound like a song to us, but it certainly does the trick or we wouldn’t have been watching a young nuthatch being fed by parents on our bird walks. What about the simple song of the chickadee – “fee-be” or “fee-be-bay”? 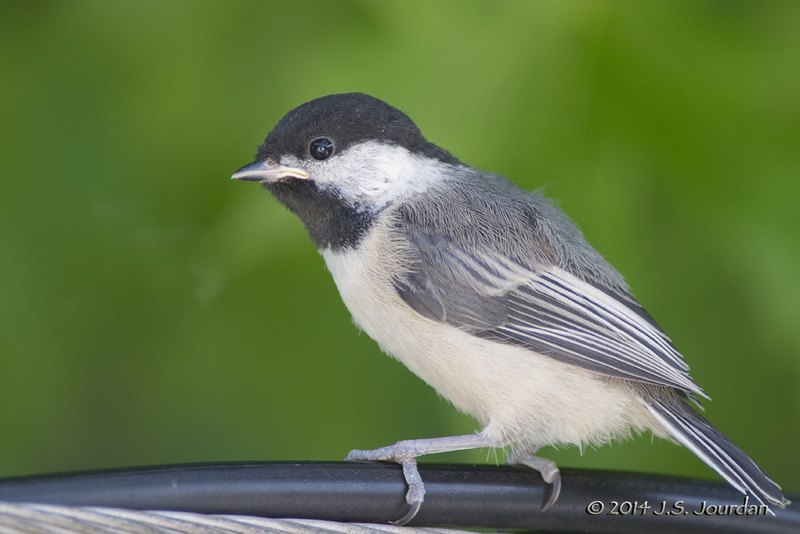 Not a very long or complex song, yet chickadees are classified as songbirds. Birds sing first and foremost to express territory ownership. With his song, a resident male alerts other males of the same species that the territory is taken. Secondly, the song is meant to attract a female of the same species so that the male can carry on his genes. After mating has taken place, the males’ song acts as a pair bond, letting the female know that her mate is within their territory. 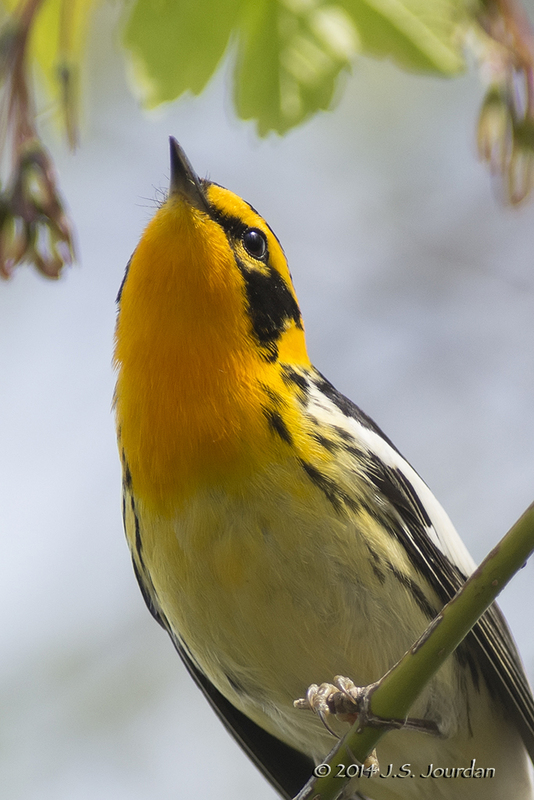 From a birdwatcher’s perspective, song has a different meaning. The complex, burbling, and constant song of the house wren lets us know that he has returned, ready to claim the nest boxes that have been set out for use. The various songs of warblers alert us that they have safely arrived this far in their migration. As foliage becomes thicker, songs alert us as to which birds to look for if we are out and about with binoculars. There are many songbirds that can be attracted to feeders including goldfinches, house finches, cardinals, chickadees, jays and nuthatches. Then there are other songbirds that are attracted to feeders that many people do not prefer including red-winged blackbirds, cowbirds, and common grackles. There are also some premier songbirds that we wish we could attract to feeders such as the wood thrush and veery; alas, they are not attracted to anything but insects. “The grackles are here and that is quite clear. How ironic that each of these birds are part of the same family of birds, the Icteridae, making them related even though their songs are so dissimilar. Whatever a songbird means to you, this is the season for listening. The earlier in the day the better, to take advantage of the possibilities that are open to us. To heighten the experience, close your eyes while you are sitting in your yard and key in on your sense of sound. You’ll be amazed at what you might hear this time of year.